Since 2001 BEAR Scotland Ltd., has been responsible for the management and maintenance of the North East Trunk Road Unit. The contract for the North East has recently been regained and BEAR have also been appointed to manage and maintain the South East Unit. BEAR has developed and implemented Route Signing Strategies – comprehensive initiatives to provide clear, coherent and consistent road user information to current design standards. The use of contemporary sign-making materials is also considered during the process, along with innovative traffic and road safety products. Redundant sign clutter and obsolete sign illumination is also identified as part of the individual route studies. Another aspect of these studies is the use of ‘Crash friendly’ sign supports (also known as passively safe structures). By applying the principles of good risk management, it is necessary to remove traditional steel posts and replace them with proprietary posts which either crumple or collapse on impact by a vehicle. Other means of minimizing risk were also examined. 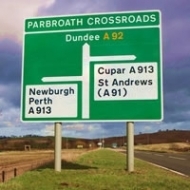 These include the complete removal of redundant signs and posts, redesign to reduce sign and post size, and suitable relocation and simplification of post assemblies. The most recently completed scheme to adopt these principles covered a 12 mile section for the A92 trunk road through Fife. BEAR Scotland Ltd., installed more than 120 new signs. All signs were manufactured using Nikkalite® Crystal Grade (CRG) micro-prismatic sheeting which met all the specification requirements set out for the project.